The year is 1430, a time of unrest and upheaval in the Holy Roman Empire. Echoes of the Papal Schism are still heard in all the lands, the Turks advance in the Balkans, and the Hussite Wars ravage Bohemia. Even while battling the Hussites, Upper Lusatia prospers. It has been nearly 100 years since the founding of the League of Six â€“ a group of wealthy Lusatian towns that banded together to defend their commercial interests and preserve stability and order in the region. You have been sent to this embattled land in the role of tax collector. As a young, ambitious aristocrat, you hope to stand out so that you will be given a position in the court of Sigismund, King of the Romans, King of Hungary, and King of Bohemia, the man who will eventually, God willing, be crowned the Holy Roman Emperor. 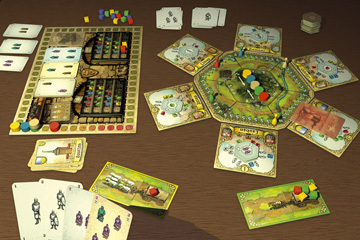 The game consists of 6 turns representing six years. Each player takes the role of a tax collector visiting one of the 6 towns. The goods collected are placed in the royal stores or civic stores, thus giving the players infl uence in the court of King Sigismund (either directly or through the support of various civic leaders). The winner is the player who gains the most influence.